Although hiding a camera in a bathroom in most cases has negative connotations, there might even be some legitimate reasons why you might want to install one. But hopefully you are researching this topic for safety reasons in order to know how to protect yourself from hidden cameras in public bathrooms. Secretly recording people in bathrooms has become more and more common over the past years with many news outlets writing about strange cases such as finding cameras in restrooms in airports, restaurants and even personal homes. There are a variety of hidden cameras offered on the market and a majority of them have a very acceptable price range. These cameras can easily be purchased online and there are plenty of tips and guides if you’re looking to install and hide them, so literally anyone can do it. With technology constantly improving these tiny cameras and devices are getting smarter and better concealed every day so you need to be on the lookout for strange objects if you suspect you might be being watched in your bathroom. Would you ever think there was a hidden camera in this air freshener? Hidden bathroom cams come in different sizes and disguises, and the less obvious they are obviously it’s the better for whoever wants to keep recording in secret. Typically there are mounted on a ceiling or a wall in public restrooms, often disguised as mirrors, smoke detectors or other inconspicuous objects. In homes they can be in the shape of air fresheners, wall clocks, shower gels, flower vases, and even coat hangers. 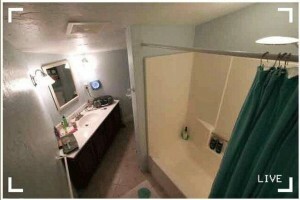 You can take a look at this site for example to find a few spy cameras that are easy to conceal in a bathroom. As you can see these spy cams are extremely accessible in prices and you might never suspect them. Hidden cameras, as their name suggests are always concealed and never obvious, which is the first thing you need to remember. They can be wireless and powered by batteries, so you don’t necessarily need to be on the lookout for wires. Recording can be done on a memory card or even transmitted wireless to another nearby device. Unfortunately there really isn’t a fail-safe way to detect hidden bathroom cameras. Considering how easy they are to buy, install and hide if someone wants to record you chances are you may not even notice it until it hits Youtube. It may be illegal or at the very least ethically wrong to do, but that doesn’t stop people from doing it. I do hope this article helped you understand at least a bit about how these bathroom spy cameras work and make sure you are always on the lookout for anything suspicious, even in your own home.